Welcome to the Red Sea an elite diving destination with Divers United. ​Welcome to the Red Sea an elite diving destination where Divers United offer dive holidays and a full range of beginner and diver development courses in Sharm el Sheikh.. Divers United offers a ‘personal touch’ to your Red Sea scuba diving holiday in Egypt and will cater for your every need. To all those experienced divers simply wishing to holiday and dive the magical sites the Red Sea has to offer, you won’t be disappointed. Divers United offer dive trips on the elite boat to many fantastic locations and you could even further your diving qualifications with their Sharm El Sheikh Dive centre, Divers United, which is a 5 Star PADI Resort Centre. If you want to learn to dive or simply advance with your diving qualifications then Divers United offer an extensive range of diving courses. Just let us know what you need and we’ll advise you how to achieve it. The Divers United motto is "No Problem, it’s your dive holiday, just relax and enjoy", and they mean it. ​About Red Sea elite diving with Divers United. A British owner managed dive center in Sharm El Sheikh offering dive holidays and PADI courses. Experience the Personal Touch from Elite Diving. 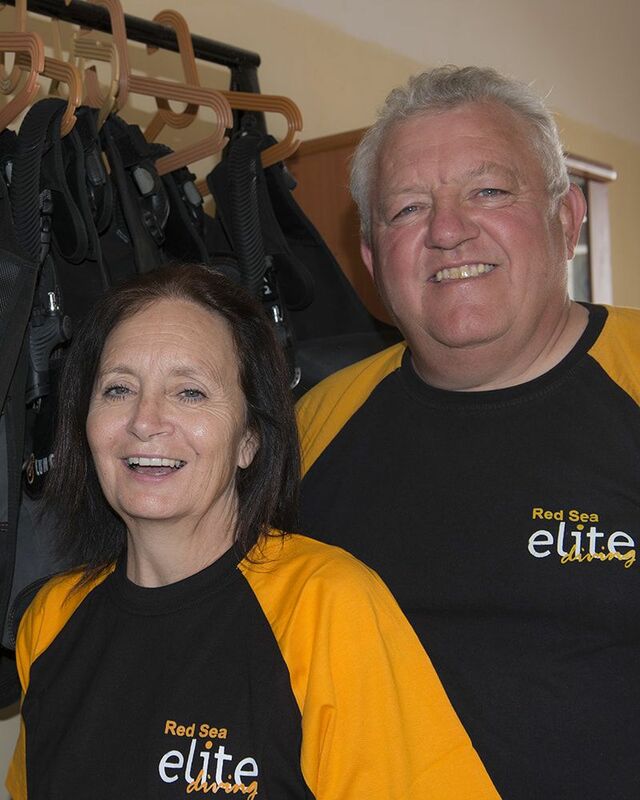 Elite Diving with Divers United is a British owned and managed family business. It was formed by husband and wife team Alun and Moyra Evans, who are divers themselves, and have been diving since 1984. They settled on the Shores of the Red Sea in 2002, to pursue their dream of making a career of the activity they both love so much. In 2005 they formed Elite Diving which in turn took ownership of Divers United in early 2008. With Elite, every guest becomes a friend, and most come back every year, some, twice or three times a year, to dive with Alun and Moyra in the sub tropical waters of Sharm el Sheikh. As safety has always been a priority, together with high quality and standards of service, they became, in a short time, a 5 star PADI Resort. Alun and Moyra’s both sons ‘G’ and ‘H’, have worked in the family business, and their eldest son, Gwyn, known to most as just ‘G’, now works full time in Sharm with elite. ‘G’ did his dive master back in 2003, and worked part time for elite during his regular visits to Sharm. 'G' decided to join the family business on a full time basis back in 2014, when he moved to Sharm el Sheikh. After gaining experience of all aspects of the business over four years, he now manages the dive center. Also in Sharm, dreams comes true. Gwyn met his future wife Valeria, an Italian diving instructor who loves the Red Sea and who has the same passion for the deep blue. Valeria has already become very popular with elite's regular divers, when socialising with them by 'G's side in the evenings after diving. Elite diving with divers United has now become even more of a family business with the addition of ‘G’ and ‘V’ to the team. You can expect high safety standards and service, with Welsh and British humor and Italian hospitality, where everyone feels at home and a part of the extended family. Come and be part of the family. Come and have fun.